Sights & Sounds of East Oakland: What's the oldest Black-owned business on International Boulevard? Nehanda Imara wrote to Hey Area, KALW’s community-journalism project, and asked: "What is the oldest black business still existing on East 14th Street?" East 14th street is of course now known as International Boulevard. The name was changed in 1996, though many residents still refer to it by its original name. It’s Oakland's longest commercial street. Imara says she wanted to find older Black-owned businesses in the region ... before they all disappear. "I know East 14th, which some people call, you know, International Boulevard,” she says, “there were lots and lots and lots of Black-owned businesses back in the day. And with the changing landscape, especially now, it seems to be changing more rapidly." Imara says she just wants to make sure people stay aware of the history of the neighborhood. "Oakland prides itself on being a town of diversity,” she says, “and you know, folks who have lived here 30, 40, 50 years remember it as a thriving place for Black businesses, Black culture. [P]eople who are here now don't know that history. I think it's important that that legacy is known by everybody." Imara's question is actually pretty hard to answer, and I strike out the first few times. Both Oakland’s Metropolitan Chamber of Commerce and the African American Chamber of Commerce say they don’t keep that kind of information. 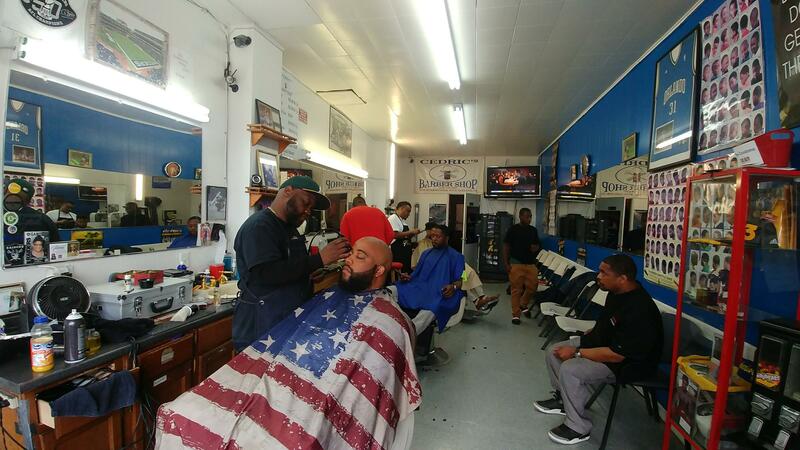 So then I decide to go to a local barbershop — Cedric's — which is on the former East 14th Street near 88th Avenue. The owner Cedric Lewis suggests another barbershop. East Oakland business owner, Cedric Lewis edges up a customer in his International Ave based shop. "Well, of the ones that I could think of that was a barber shop,” he says, “Hamilton's barber shop has been around quite a while. Approximately over thirty years." Lewis thinks it’s been around since the 1970s. I go to Hamilton's, at 61st Avenue, but the current owner hesitates, and finally says he doesn't want be interviewed — though he does say he has been the owner for only about 10 years. I check some Yelp reviews where people mention that they went to Hamilton's as teens in the late ‘70s. So it does seem like it’s been around 35 to 40 years. Then I find some other businesses along the street that have been around for a similar amount of time, but most didn't have continuous African American ownership throughout those years. For example, the Food King grocery at 88th Avenue was originally Black-owned in the Sixties, but is now owned and operated by a Yemeni family. It looks like I’m finally getting somewhere, but I need more help. That leads to a change in tactics. I head to the African American Museum and Library at Oakland, or AAMLO, which has archives and historical records. 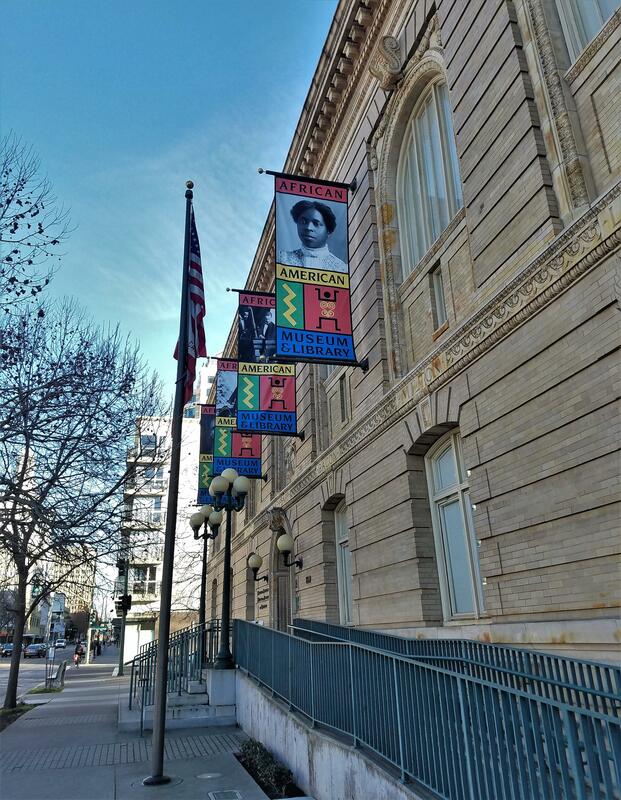 It's in a historic 1902 Carnegie Foundation building, and was Oakland's original main library. Inside, it’s all marble surfaces and neo-classical architectural details. The exhibits are on the 2nd floor and the archives are on the first. I meet with archivist Sean Heyliger, who’s done some research for me on Black-owned businesses. The husband, he continues, one Mr. Stephens, was the assistant to the Crocketts, a railroad family in California, which is where he learned the hotel business and the restaurant business." Heyliger also tells me the family had a daughter, Virginia Stephens, who became the first African American woman to be accepted to the state bar. He also tells me about a black airline out of Oakland Airport in the 1960s, and notes that the “flowering” of larger African American enterprises can be linked in part to Trans Bay, a Black-owned bank started to provide mortgages for African American families. 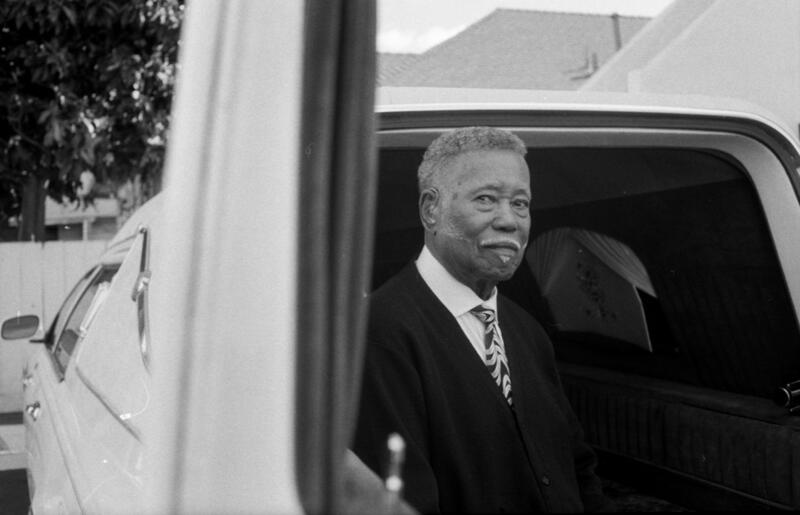 I ask Heyliger about Black-owned businesses that are still open now, and he tells me about Luther Hudson's Funeral Home, founded over 100 years ago. But, as it turns out, it’s in North Oakland. I propose another funeral home as a candidate, one that someone had suggested which also was old: Thompson’s Funeral Home, which is on East 14th at 99th Avenue. He says that’s probably a good bet. A funeral home, Heyliger says, "was one of the few businesses that were open to African American entrepreneurs at that time. A lot of other businesses they were excluded from. And so a lot of the early entrepreneurs and people who eventually moved into other areas, like politics, were African American funeral home managers." So I visit Thompson’s Funeral Home and talk with the owner, Arthur Thompson. Thompson, who's soft-spoken and in his 80s, greets me in his office. On one side is a large fish tank. On the other, a woven tapestry of his face with text celebrating his over 45 years in business. "I funeral direct, I clean up, and I also arrange. I follow the needs of the families. That's my job,” he tells me. Mr. Thompson is a well-manicured, old-school professional with a trimmed grey beard, a crisp tie and a twinkle in his eye. He runs the funeral home with his wife and three employees. Mr. Thompson not only founded his funeral home in 1969, he literally helped build it in the years leading to its opening. Thompson explains: "Every brick around the building I’ve had in my hands, personally, three times." And he's been part of significant moments for Oakland’s Black community, including services for the Soledad Brothers, George and Jonathan Jackson; and also for Tookie Williams, who was known as one of the original founders and leaders of the Crips gang in Los Angeles. "We did his funeral both here in Oakland and in Los Angeles,” he tells me. Thompson has seen the neighborhood change a lot over the years. From inside his office, he narrates a kind of tour of the changes along the avenue. "There used to be right across the street from me a place that was similar to the buffets that you have out in Hayward, Hometown Buffet,” he says. “They used to be where that medical center is over there … The Big O tire place across the street used to be a Texaco service station. Where McDonald’s is over there, that was a record store, and they had a hardware store over there. Where the fire station is, they used to have a hot dog stand. Where the Arco service station is, that used to be an auto repair building. Next door was a liquor store. Next to there was a doctor's office. And next to there, which would be right next to my building, an apartment building. They moved that about two blocks away. So basically everything has changed." And some of those changes he's seen underline the dwindling of Black-owned businesses in East Oakland. There are many boarded up storefronts in Oakland's District 6 and 7, which International Boulevard runs through. I have lived here almost 30 years and I have seen that continuing. Mr. Thompson thinks the city-mandated street name change in the ‘90s also had something to do with this. He says: "We were maneuvered by other areas to become International Boulevard instead of East 14th Street, because the people just past us felt that it was kind of a put-down to them being on East 14th Street. But it cost the smaller businesses, such as mine, a drastic penny for that change. Because all of the ads that we've done, all of the stationery that we had, all of the phone book ads that we had, caused us to have to make a drastic change, and it was financially draining." The factors that have led to the loss of retail businesses and general economic decline in East Oakland are numerous. There are technical barriers to starting and running businesses, and there are demographic issues like the loss of household income, especially during the recession. Now that there are micro-loans and other efforts to address equity in business, maybe things will change for new business owners. I find her at her office, and share what I learned: That the oldest continuously operating black owned business in East Oakland is the Thompson funeral home which, quite remarkably, is right across the street. "That is remarkable.” Imara says. "And that kind of business is interesting, but I guess it’s part of the cycle of life." The traffic on East 14th ebbs and flows like the business cycles in the neighborhood that residents have seen over the decades. And that traffic sound is all that remains of what I experienced as a once bustling business district here in Deep East. 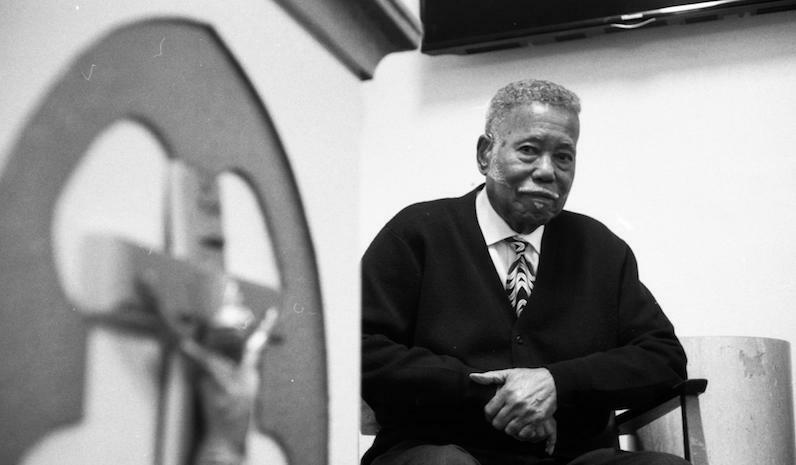 That story was produced for our project Sights & Sounds of East Oakland, in collaboration with Oakland Voices, a community media training program run in partnership with the East Bay Times and the Maynard Institute for Journalism Education. This question came to KALW through Hey Area, a crowdsourced, collaborative reporting project. Got a question for Hey Area? Ask it below.